Governing cabinets are composed of ministers who come and go even as governments march on. They work for the chief executive, the prime minister or the president, for their parties and for the constituent groups from which they come. They are chosen for their role and dismissed from it for all sorts of reasons that vary across time and country. This book examines the process of selection, shuffling and removal of ministers in national cabinets around the world. Drawing on original data over several decades, it offers a series of case studies of countries from around the world with differing institutional and cultural structures including presidential and semi-presidential systems, and parliamentary, unitary and federal systems, some of which have experienced periods under authoritarian regimes. 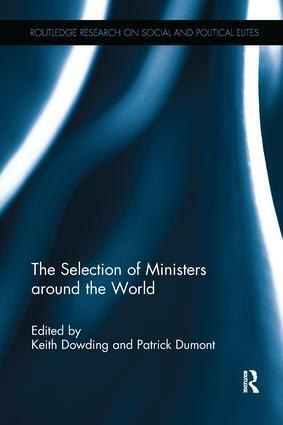 Featuring 14 case studies on North and South America, Asia, Africa, Australia and New Zealand, this book complements the earlier volume The Selection of Ministers in Europe (Routledge, 2009). This volume will be an important reference for students and scholars of political science, government, executives, comparative politics and political parties.